Opera Chic has been on lock-down since returning to the US and A, receiving flocks of relatives and friends that have congregated to welcome back their wandering Odysseus. Today I managed a few hours to myself, and like a ninja, I broke-loose and stealthily whisked into Midtown Manhattan to get a Broadway fix. 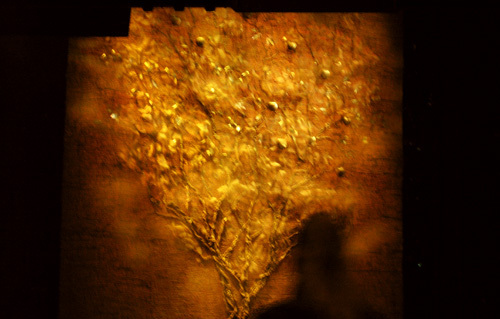 I chose The Apple Tree, but it was kind of rotten and mealy! ahahaha looks like somebody got owned (it was me). 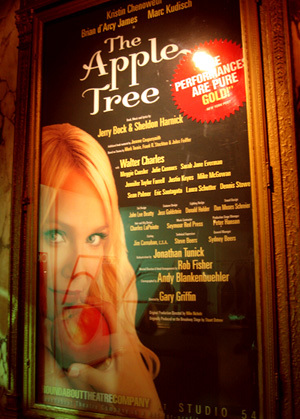 The Apple Tree (starring Kristin Chenoweth) at Roundabout Theatre Company (Ye Olde Studio 54) was originally on b'way forty years ago (1966), and only ran for one year...but they probably should have just sealed it up in a time capsule and sunk it to the bottom of the Hudson River. It was painfully dated, stale, and plagiaristic: every convention was borrowed heavily from its contemporaries, the other major broadway hits from the 1960s. The narrative was presented in three completely disjointed, isolated vignettes, but all were about the relationships between men and women. Oh. great. yawn. The first story was a moldy and pedestrian battle-of-the-sexes. It was inspired by Mark Twain's "The Diary of Adam and Eve"...but if poor Mark Twain knew that his work would later be the foundation for such fodder, I'm sure he would have never published it. The second tale was a geographically confused story of a princess who holds the fate of her forbidden lover in her hands, and was based on Frank R. Stockton's cliffhanger "The Lady or the Tiger?" The third interlude was the tale of a mousy chimney sweep by day, and a a Jayne Mansfield-esque star by night. THE LAMENESS IS CALLING FROM INSIDE TEH THEATER. GET OUT NOW! Brilliant Chenoweth made a clever choice to sign the contract for this run, as it hopefully yields lots of profit while exercising almost no vocal strain (the protaganist's score has a range of like two octaves at the most). The only appeal is Chenoweth's skillz. Whatevs. A very generous NY Times review is here. Regardless, I'm still bubbling because it's amazing to be back in NYC...the pulse, the speed, the light. And Opera Chic promises that his week will be filled with opera and symphony (-20 broadway). Stay close!